Upper Photo: Acer negundo.M. B. Gargiullo (ca 2010). 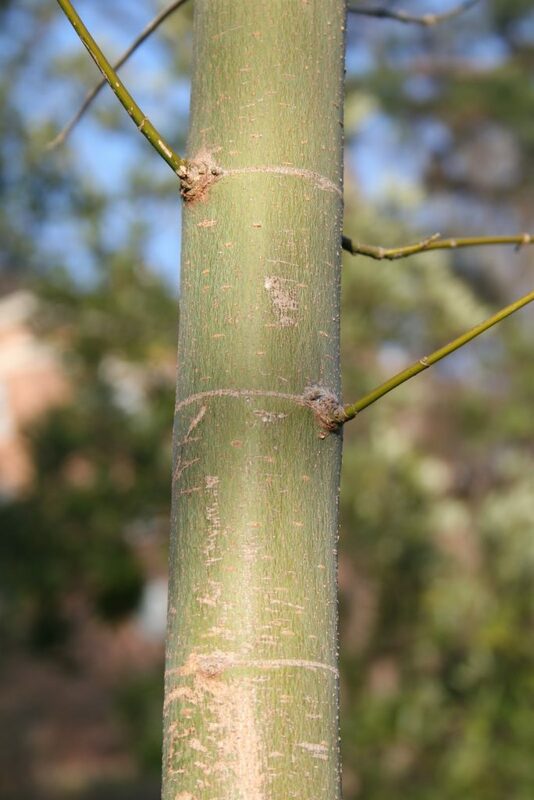 Acer negundo is a tree to 20 m tall, usually shrubby, leaning, often multi-stemed, short-lived, about 60 years, fast growing, but sometimes becoming large trees; roots associated with arbuscular mycorrhizal fungi (AM, endomycorrhizae, Zygomycotina, order Glomales, family Endogonaceae) (Decker and Boerner 1997; Carreiro 1999); twigs pale green to green-purple, with waxy bloom, cut plants stump sprout readily; winter buds blue to purplish, densely finely white-hairy; bud scales opposite, overlapping. Cut trees quickly resprout often with multiple shoots (DiTredici 2010). 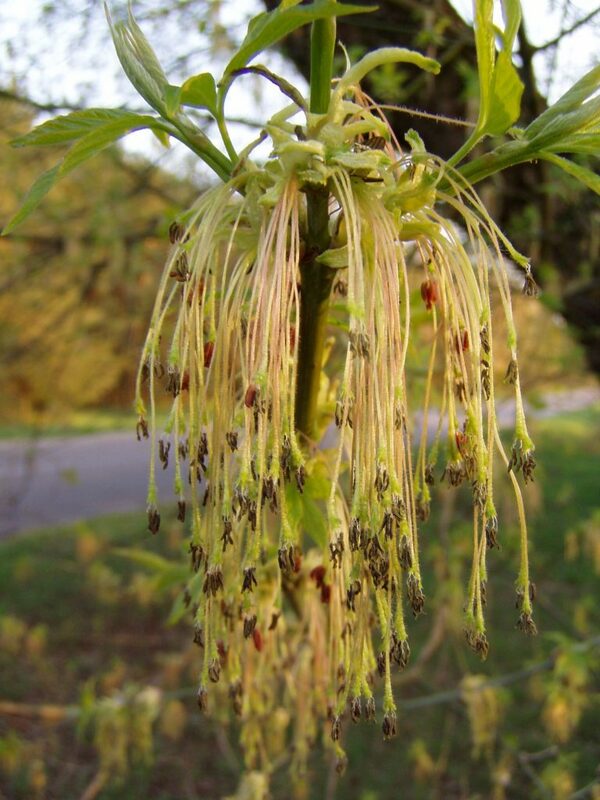 Acer negundo flowers. commons.wikimedia (Accessed 5/2017). Flowers reddish to green, no petals, small, sexes usually on separate trees (dioecious); male flowers on drooping stalks in umbrella-shaped clusters, female flowers in drooping, unbranched clusters (racemes); sexes on separate plants (Wilson 1986); blooms March-April; wind pollinated. 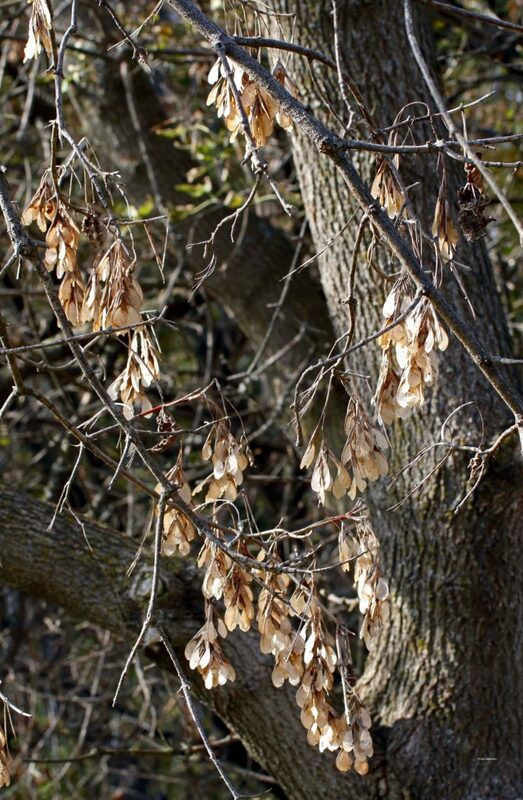 Fruit dry, pairs of winged seeds (samaras), each 3-4.5 cm long, attached end to end, splitting apart as dispersed, ripens Sept.-Oct., persistent, wind dispersed throughout winter. Germinate in spring on bare moist soil (DiTredici 2010). Acer negundo. young green bark. Centenary College Arboretum. centenaryarboretum.blogspot.com (Accessed 5/2017). Acer negundo (box-elder) seeds. Ben VanderWeide. Oakland Natural Areas. oaklandnaturalareas.com (Accessed 8/017). Habitat: Flood plains, moist, disturbed soil of roadsides and edges, tolerates soil pH 5-8. Tolerant of flooding, saturated soil up to 75% growing season; tolerates drought; compaction, demolition debris, concrete rubble, old blacktop. Moderately tolerant of salt. Intolerant of shade, index 1.8, shaded out as canopy closes (Hightshoe 1988). Notes: Seeds, buds and flowers eaten by songbirds, squirrels, chipmunks and smaller rodents. Twigs eaten by rabbits (Martin et al. 1951). Attacked by Fomitopsis fraxineus, Verticillium albo-atrum (Verticillium wilt). Didymosporina aceris (syn. Marsonina truncatula; Deuteromycotina) causes two-toned tan and brown spots on leaves (Dirr 1990; Sinclair et al. 1987; Agrios 1988; Burns & Honkala 1990). A host tree of the Asian longhorn beetle, Anoplophora glabripennis (see Norway maple). A host of the periodical cicada, Magicicada cassini. This cicada spends up to 17 years as an underground nymph, which lives on tree root sap. Nymphs mature together and adults emerge all at once to mate. Females cut slits in the bark of small branches into which they lay their eggs, usually causing death of the branch tip. The larvae hatch and drop to the ground restarting the cycle. Tree damage can appear very extensive with many drooping, dead branch tips left by a cicada emergence. However, a study by Cook and Holt (2002) found no significant decrease in growth due to this damage, at least to boxelder.